Recently I met a photographer at a wedding where we were supplying our Asquith (Albert) as the main bridal car. Whenever I am driving for a wedding I always try to strike up a rapport with the photographers for two reasons, 1 I have a keen interest in photography myself, 2 I am keen for the Bride & Groom to have the best photographs with our taxis that their photographer can capture. This particular photographer, Hannah Millard, caught my attention as she was doing something a little different to most traditional Wedding Photographers, she was doing something that is referred to as Fusion, this is a blend of taking photographs and video by the same person. Fusion photography is quite popular across the pond in the good old USA, but hasn’t really taken off over here at present. Getting back to the point of this post, I took one of Hannah’s Cards and looked her up on the net. reading through her website I came across an excellent blog post of hers where Hannah has a bit of a rant! It’s not just that though, we hear these things all the time from photographers, complaining about so called “Weekend Warriors” (people who run a photography business on the side of a day job), self-taught photographers, anything new and different. According to some photographers the industry has gone to the dogs. They look back on the good old days… when photography was for the elite and equipment was out of reach. The golden age. Well I say: balls to the golden age. Things are better now. Here’s to all those people out there will say “I was at this wedding once and the photographer was bloody awesome”, “That photographer felt like one of the family”, “Wedding photographers are really passionate about what they do”. I can really see where Hannah is coming from with this blog post, all too often I see wedding cars with drivers who really look as though it is a chore to drive the happy couple on their special day, miserable faces, not a smile in sight! Earlier this year, we supplied 3 of our White TX Modern Taxis for a wedding where the main bridal car was a Rolls Royce Cloud, we didn’t realise until this car turned up that we would not be taking the bride. Just after the Rolls arrived, (we were already at the pickup address) the heavens opened and it literally poured down. The driver of the Rolls, which was obviously costing a lot more than one of our Taxis, did not even get out of his car. I ended up liaising with the Brides father and I stood out in the rain with 2 umbrella’s, and escorted all of the guests into our taxis and also the Bride and her Father into the Rolls while the driver just sat in the front and didn’t attempt to even get out, while I ended up wringing wet. I am not even sure if he had an umbrella! When I drive I like to try and provide the best possible service that I can, I open doors, help with bags and luggage (even if they are not going in our vehicles) I try to be the couples personal butler while they are in my care. I know that I always say this, but I feel privileged to be a part of peoples special day. 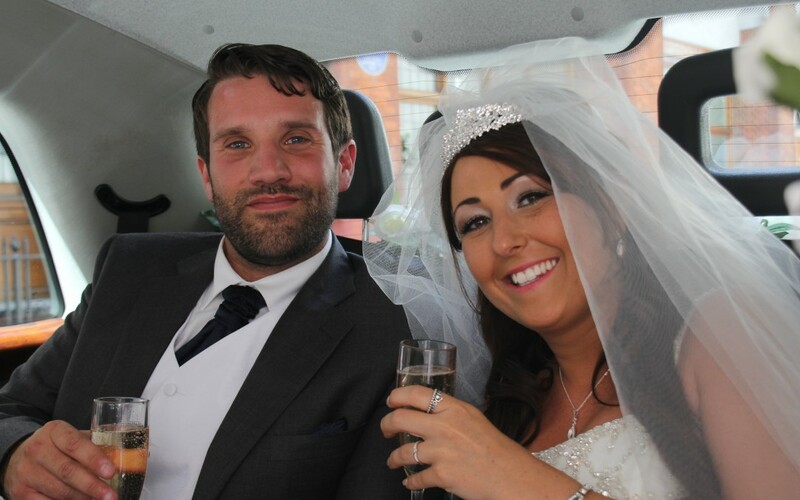 I like nothing more than to send the happy couple off to their reception thinking that I have done the best that I can to help make their day as enjoyable as possible and alleviate any stress or anxiety that they may have been feeling while in the taxi. I enjoy driving our Taxis for weddings, I enjoy being part of the special day, I take pleasure in seeing the newly weds emerge from the church and I am genuinely happy for them. Nothing pleases me more than when the bride thanks me for making her day special and that she was happy with the service that we provided, and I am thrilled with the many letters of thanks that we receive. In the Wedding business there isn’t really “repeat business”, well you hope not anyway, you hope that the couple who have used your services spend many happy years together, the rest of their lives. But you do hope that your past clients were happy enough with the service that you provided, to be able to recommend you to other prospective brides and grooms.